We came upon these in a local spa and fell in love! 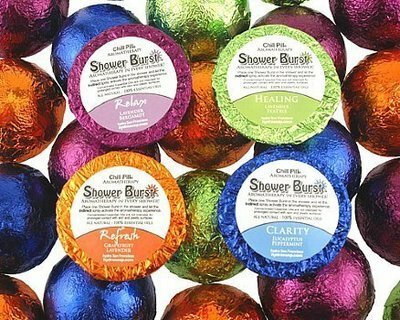 Shower Bursts are little packages of pure essential oils and essential oil blends designed to help you create a spa experience in your own home. Made with only the finest of essential oils, these Bursts dissolve in the presence of steam. To use, place an unwrapped Shower Burst in the indirect spray of your shower, on a soap dish, or in a sachet. As it dissolves, the essential oils mix with the rising steam to create a mini spa experience. We've found there are two ways to use these. For longer use (2-3 showers) place the Bursts out of direct water. For an intense, 'burst' of pure aromatherapy, place the Shower Burst on the floor of your shower. This will last only for one shower, but the effects will be stronger. Shower Bursts make great gifts. I sent a few to my daughters who are away at college (the Tension & Stress and the Refresh) and they loved them. They make for much appreciated gifts for co-workers, teachers, friends....and yourself!